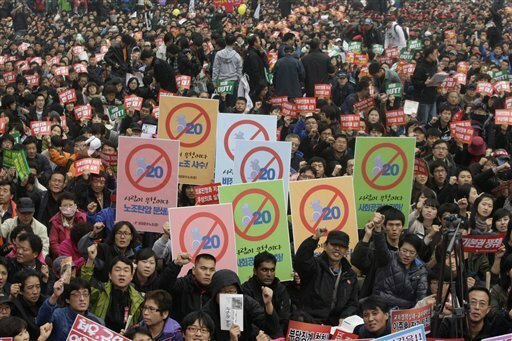 Tens of thousands of union members, social activists and students gathered in Seoul Sunday to protest the Group of 20 economic summit meeting that begins on Thursday. Tens of thousands of government employees marched in Portugal’s capital on Saturday to protest an austerity budget that would slash their salaries. Thousands of protesters in France and Germany have attempted to block a train carrying nuclear waste. Some protesters chained themselves to the train tracks while others drove trucks on to the tracks. Hundreds of protesters have been detained. On Sunday, Cafe de Coral, Hong Kong’s biggest fast-food chain, said it had ditched plans to scrap paid lunch breaks for its employees after a public and Facebook campaign was mounted boycotting its restaurants. Hundreds of gay and lesbians protested the Church’s position on gay marriage by kissing publicly as the pope passed by on his way to the Sagrada Familia in Barcelona on Sunday. In Oakland, police arrested 152 protesters who streamed through the streets Friday after a white ex-transit officer received the minimum two-year prison sentence for fatally shooting an unarmed black man on a California train platform two years ago. A group of 400 survivors of the Bhopal disaster have been protesting Obama’s visit to India. In addition, the cotton growers of Vidarbha, who are suffering immensely due to the prevailing agrarian crisis, staged candlelight protests ahead of US President Barack Obama’s India visit on Friday. Inhabitants of Jaftelk village, Jericho district, in the Jordan Valley organized a protest sit-in on Saturday with the participation of foreign solidarity activists against Israeli settlement activity.